Every year I say the same thing: “How does Christmas come so quickly? 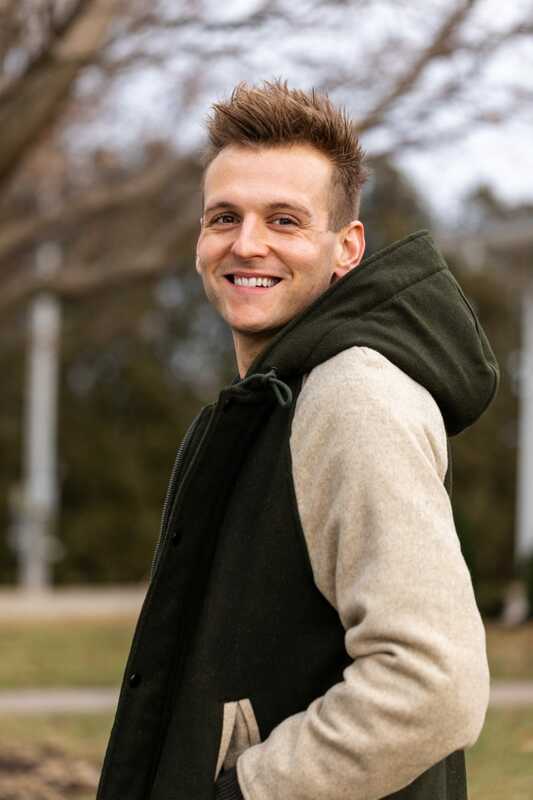 !” During the year, I look forward to December: the baking, the wrapping, the parties and most of all, my sister’s family’s visit from Virginia. Then summer hits and I’m outside all day working in the yard, harvesting from the garden and building up my stock of canned goods. Fall seems to arrive overnight and with it, the pumpkin harvest. As you know, I love to decorate my entire farm with them and of course use them as the base for so many of my fall-time recipes. Then like magic, it’s Thanksgiving and I feel just a bit behind schedule for the holidays. This year, I tried a different approach. I hosted my annual Christmas party earlier than usual. Doing so started the season with a festive gathering at home, complete with good food and great people. And part of my plan included the decision not to overdo. Yes, that may sound easy, but it’s not as simple to implement. 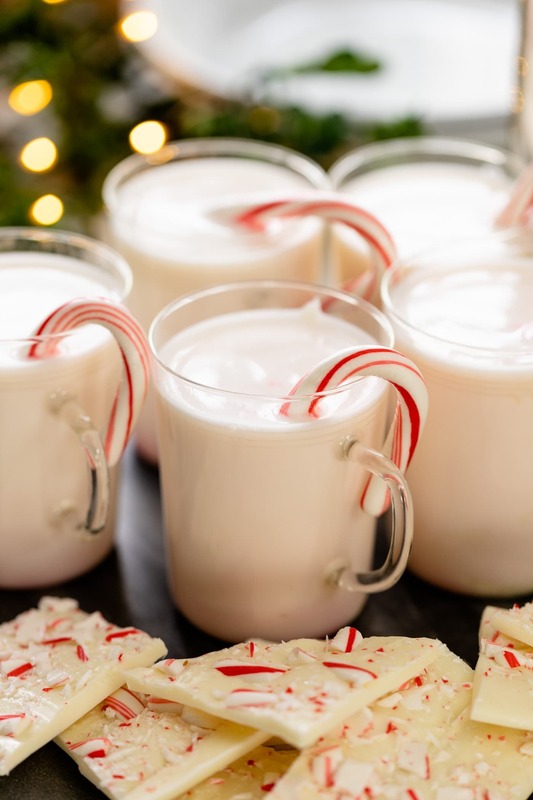 One of my keys to success: this peppermint-flavored white hot chocolate! Paring down gifts: Gifts are usually a headache. But instead of hunting down every gift during the months of November and December, if I saw something during the year that I knew someone would like, I bought it. Part of this intentional gift-giving shifts the focus from the number of gifts to the meaningfulness of each gift. Making the most of the season: This season, I’m savoring the time I spend with the ones I chose to be with. It’s no surprise that with a to-do list off the charts (and yours may be even longer than mine! ), I don’t take enough time to be with people. It takes a conscious effort not to whip up every single Christmas recipe, but only those items for which I have time. My aim is to spend more actual time with friends and family and less time fretting over what I need to do. This means deriving joy from watching a movie with friends rather than baking another batch of cookies. The Christmas party put me in such a cozy spirit. The day was bright and sunny. There was snow on the ground (yay!) and Kip was having a ball. Since my house just isn’t big enough (yet!) to host all of you, I hope you feel that you received a personal invitation to the party through this season’s videos. I loved being able to show the foods I prepared and how the house was decorated. As with every recipe, I love to know what you bake and how you decorate so make sure to leave me a comment letting me know! 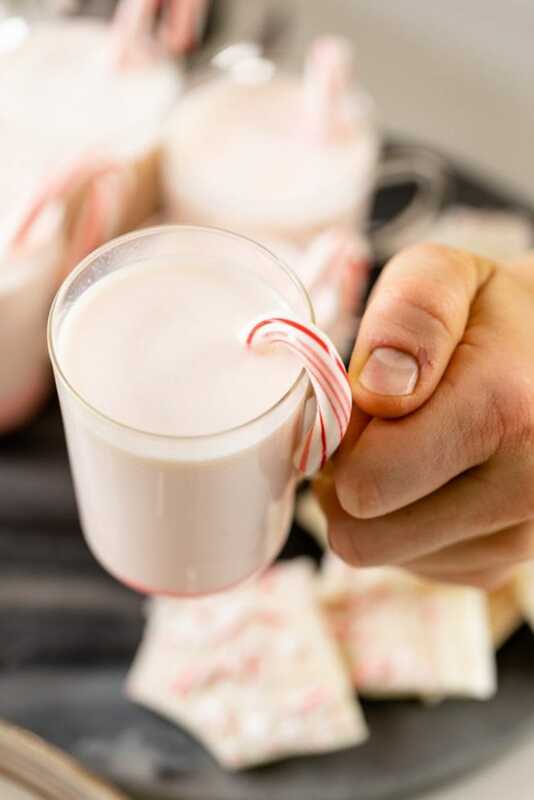 To finish the party, I served a peppermint white hot chocolate. It’s a warm, comforting drink full of Christmas spirit. If you wanna make it simple, prepare a peppermint bark with white chocolate, peppermint and vanilla. Once it’s made, all you have to do is break it into pieces and serve it alongside steamed milk. Once added to the milk, the bark melts and becomes a delicious drink! Not to steal Ina Garten’s tagline, but how easy is that?! Make sure to use a candy cane as a stirrer. It will melt as it sits in the milk. YUM! 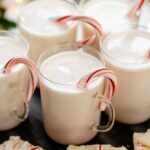 Be warned: once you make this peppermint white hot chocolate, the regular stuff just won’t taste the same. 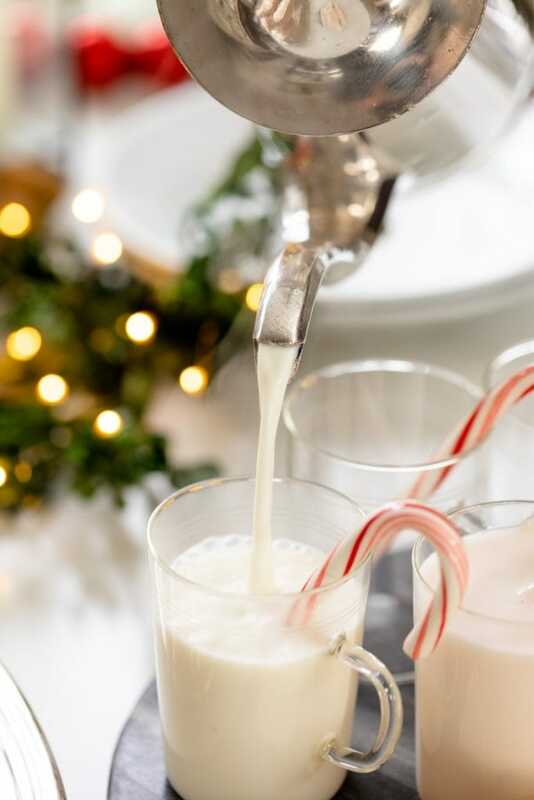 A combination of white chocolate and peppermint make this the perfect, cozy Christmas-time drink! Break the chocolate into small pieces and place in a heatproof bowl. Heat in the microwave in 30-second increments, stirring in between until melted and smooth. Add the peppermint extract and the vanilla powder and stir to incorporate. Pour into a half sheet pan and spread to an even layer. Sprinkle with crushed peppermint candy and cool until solid, about 6 hours. Combine the half and half and milk and heat to 160 degrees. Break the peppermint bark into pieces making sure they fit into the glasses. 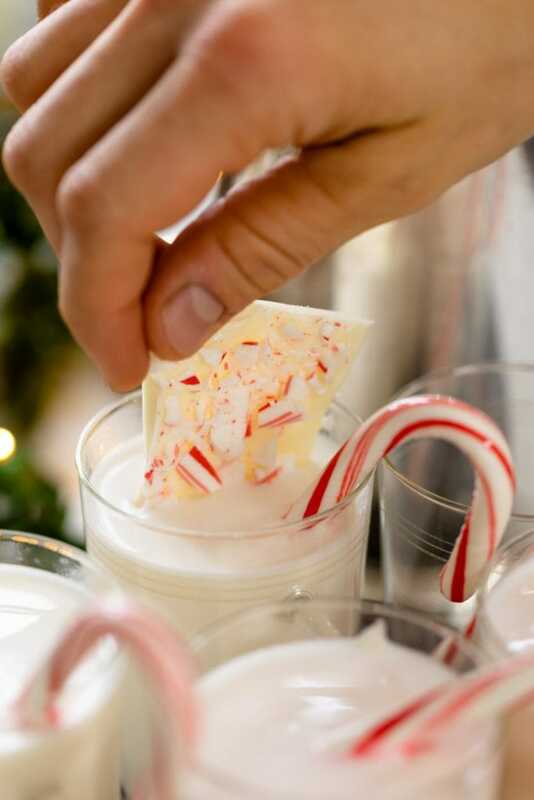 Serve the warm milk in cups and allow guests to add peppermint bark to taste.